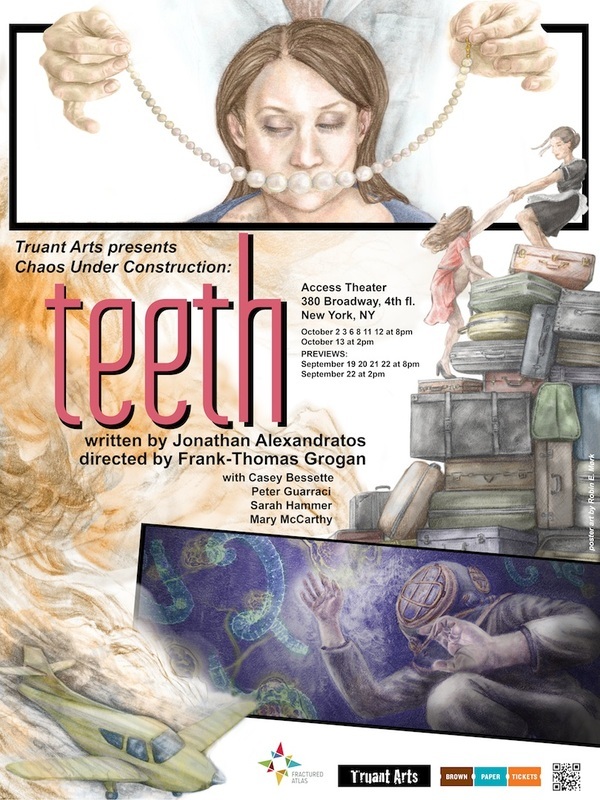 TEETH is a play about a woman who was born without a mouth. As she attempts to get a mouth, she finds something she's sacrificed: her voice. Truant: So, you're Jonathan Alexandratos. You wrote TEETH. Jonathan Alexandratos: I don't owe you guys money, do I? JA: Okay then yes. I am Jonathan Alexandratos. T: How'd you do it? T: No - how'd you write TEETH? JA: Oh it was great. I met with the director and the team of actors and I asked them all what their most important story was. Like: the most important story of their life. And one actor said something remarkable; she said, and I'm paraphrasing, that when she was younger, she was hit by a car, and that knocked out all her baby teeth. As a result, she said she still has nightmares about waking up without teeth. I mean: holy cow! I saw how moved she was by this story. And I said, "Okay, that's a good play, by itself, but what might be a really compelling play is one about a woman who is not only sans teeth, but without a mouth, too." So I used that information, working in concert with the stories the other actors gave me, and I crafted a story about a woman without a mouth. The result was a play that really connected with me. A play about the good and bad sides of sacrifice. T: And that all sprang from this collaboration? JA: Yes - which: it was so serendipitous that you guys were doing this project because, just before I was asked to come on board, I was thinking about how much I really wanted to do more interview-based theatre. Theatre that springs from the stories of others. I had done one show, called PLAY^3, like that before, and loved the process, but the question of, "Can I interview you for the purpose of putting your most intimate memories on stage?" is something a lot of people, for some reason, find kind of awkward. So I was and am so grateful to be doing this. T: Did a lot change from the first draft to the draft that came after the actors read TEETH? JA: No, not really. I paid them extra to just kinda go with it. Actually I told them you guys would. Is that cool? T: No. That's a felony. JA: Are "cool" and "felony" mutually exclusive? T: We're straying from the point. JA: It's hard to disagree. T: So, you'd want to do something like this again? JA: In a heartbeat. Theatre is, by origin, a religious medium. And I'm not talking "religious" like a particular denomination or sect or even anything organized, but look at the Ancient Greek roots: it was in worship of something. I think the great thing about theatre now is that it is in worship of the kindness and sympathy and empathy that flows from the communal experience. But in order to take part fully, you (or, speaking for myself, I) have to open your (my) heart to that community. And it gives me great joy to do that. So yes, I'd love to keep working this way. We should all be so lucky! T: Was there something surprising that came out of this process? JA: I think just the stories all the actors told, when I asked them. It wasn't that they were different - that wouldn't have surprised me. It's that they were all similar. More than one dealt with dental injuries, but they all encompassed the same set of responses: fear of losing oneself, fear of disappointing others. No one would suggest that, if you're out on a first date, you should lead with the line, "Hi, my name is such-and-such and boy do I have a trauma story for *you*! ", but, if you get to the point, with 2+ people, to share some emotional stuff, this has shown me that you might be surprised at just how similar you all become to one another. T: Can you give us a quick synopsis of the play? And please don't just recap a STAR TREK episode. We all know you can. And we all know you think that makes you awesome. For some reason. JA: TEETH is a play about a woman who was born without a mouth. As she attempts to get a mouth, she finds something she's sacrificed: her voice. JA: Well it's not a long play; it's not like summing up WAR & PEACE. T: All right. Thank you for the interview!